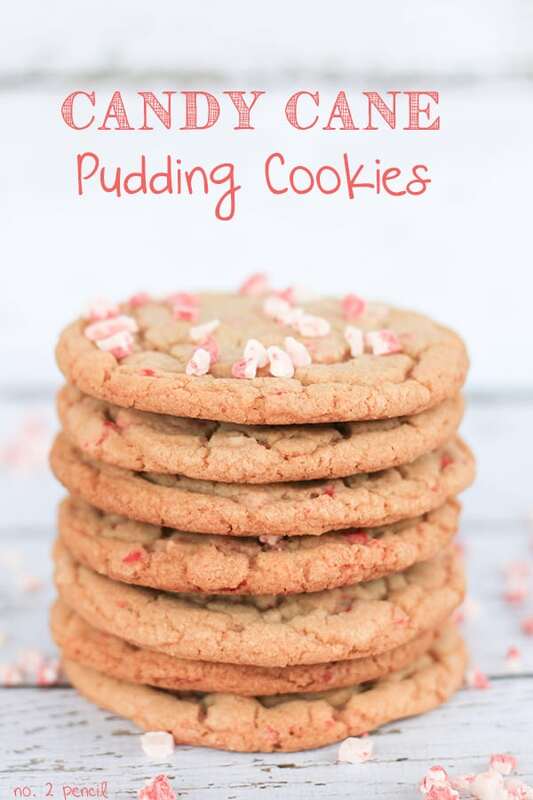 I am thrilled to be sharing these Candy Cane Pudding Cookies as part of the Ultimate Holiday Idea Exchange. Tonight, we will be filling up the Ultimate Holiday Idea Exchange Pinterest Board with brand new holiday projects and recipes. This is the perfect time to start planning! Make sure you are following the Pinterest board to see all the fresh ideas being shared! If you are a blogger, please join in the fun, we want to share your new Holiday projects as well! 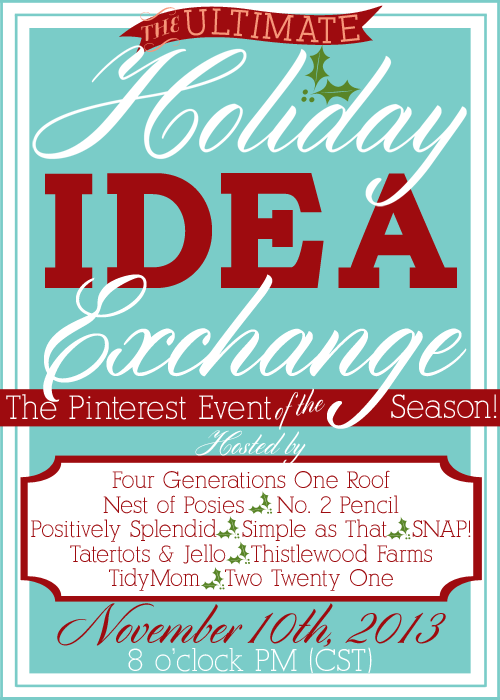 Pin and tweet your project tonight with the hashtag #holidayideaexchange so we can repin it to the board. Check out all the details here! 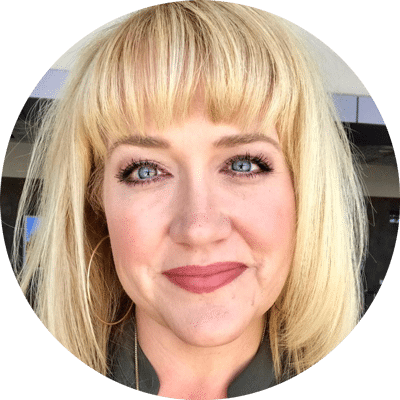 While you are at it, you may want to follow all 10 creative bloggers on pinterest!! So, on to the cookies! 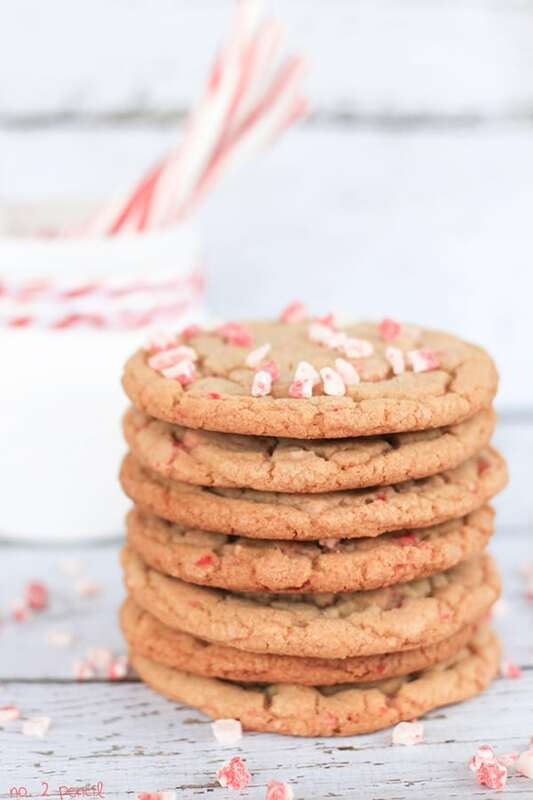 You guys are going to love these Candy Cane Pudding Cookies! I adapted my Oreo Pudding Cookies and added the amazing Andes Peppermint Crunch Baking Bits. 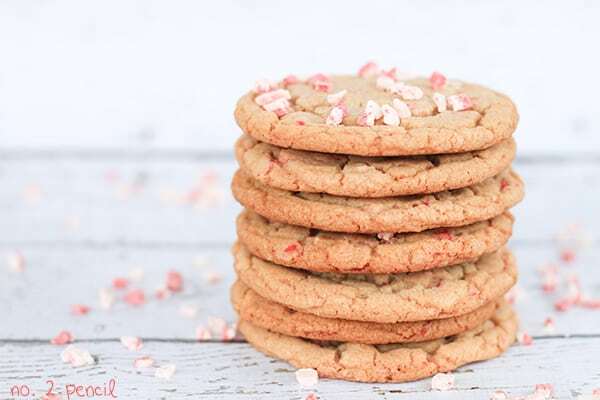 I was originally going to add crushed candy cane to these cookies, but then ran across these baking bits at Target and just had to use them. 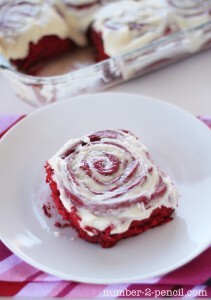 They are perfect for holiday baking! They are soft, similar to a chocolate chip, but they have little bits of crunchy peppermint candy in them. I just love the texture and color they give to these cookies! I brought these to my daughter’s preschool teachers, and they went crazy for them! 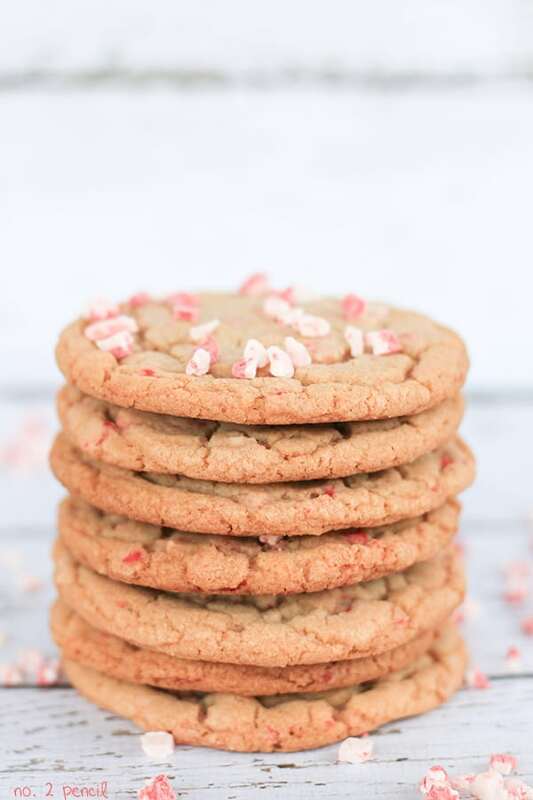 They are soft and buttery, with just the right amount of chewiness and peppermint flavor. 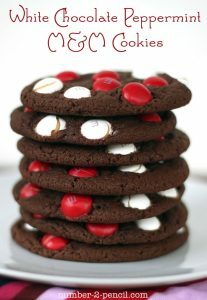 I’ve also made these cookies nice and big, so they are perfect for gift giving! In the bowl of a stand mixer, combine butter, sugars, and pudding mix until fluffy. Continue stirring and add egg and egg yolk one at a time. Add peppermint baking chips to dough and stir until combined. Form three tablespoons of dough into balls and place on cookie sheet. You can make these cookies smaller by measuring just two tablespoon of dough baking them for about 10 minutes. Be sure not to over bake! Cookies will continue baking as they cool. Remove from oven when edges are just a light golden brown. Yes….please! Thanks for sharing such a fun recipe! So much fun to be partying with you! Well, hel-lo delicious looking cookies! I’m pretty sure I’d go crazy for these beauties too! we were on the same peppermint train!!!! 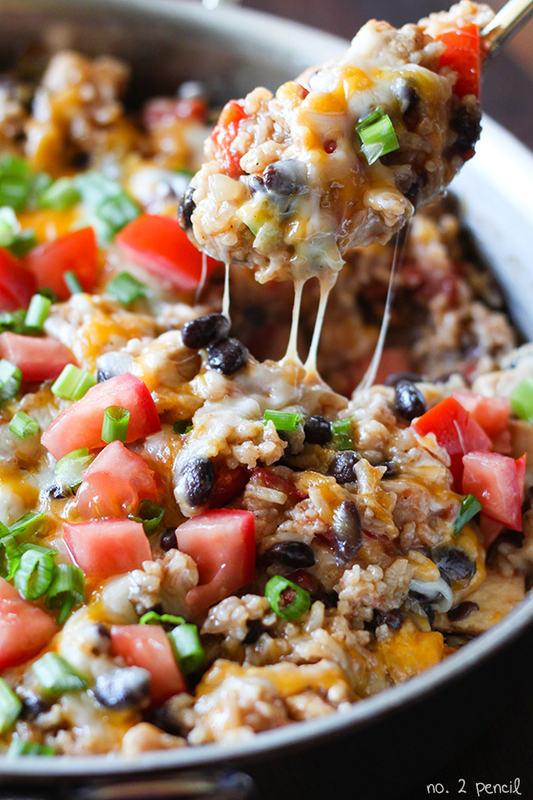 these look/sound amazing Melissa!! These totally caught my eye! I was scrolling through your featured posts and the “pudding” part of the cookie got me super interested. I’m excited to try these out! For some reason I’ve been craving that type of texture lately! Also, I’d love to become part of the holiday idea exchange!! I’m going to go check it out right now.